Hi hope you enjoyed my last post. I had a blast writing it, it brought back all those wonderful memories of happy family times. I cherish them hugely, nothing is more important than family and they should always know how special they are. One of my favourite things about Christmas is being able to kick back and spend lazy days together enjoying the little things that make us happy. Long lunches, chilly walks, hot chocolates and pyjamas, games and late night chats putting the world to rights and dreaming dreams together. Anyway lets talk cake shall we. 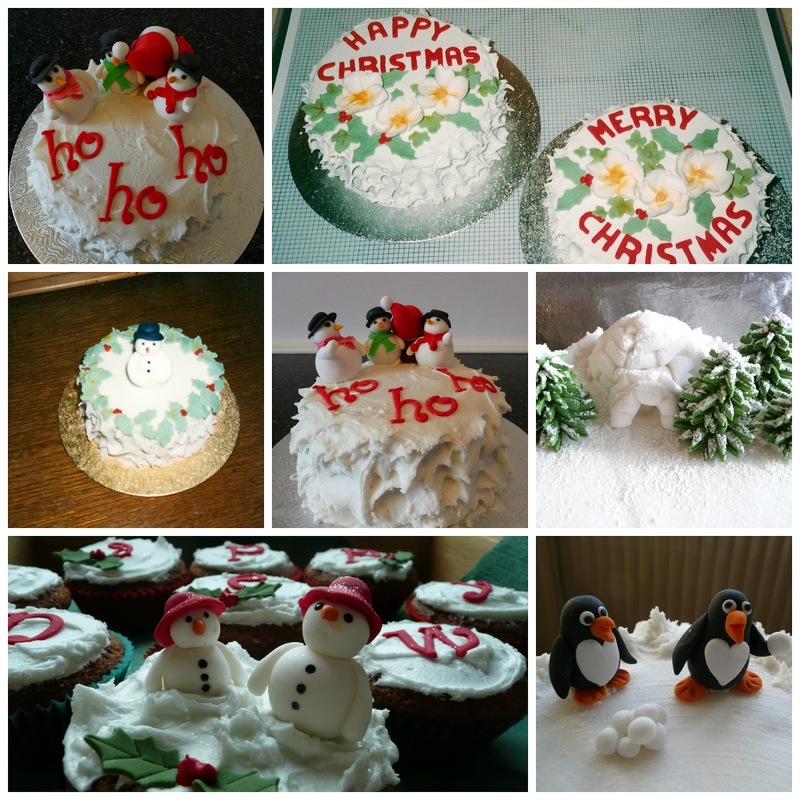 I love Christmas cake and always make mine in October half term to give it plenty of time to mature. And I love decorating my Christmas cake. Deciding what artistic theme I'll be having and generally going to town on the festive design. 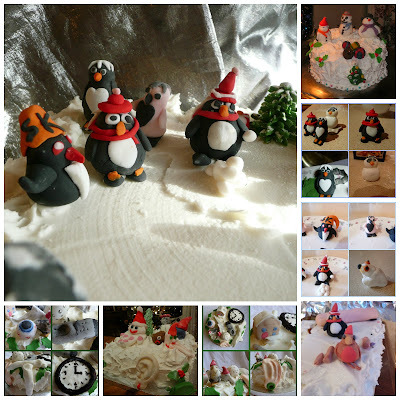 Here is a selection of some of them. The problem is with everything building up before the Big Day it often gets left to the last minute...........the very last minute. Then one year disaster struck, flu and TIME RAN OUT!!!! Everything came to a halt. This is where one of our favourite Christmas traditions was born. "Don't worry Mum" said the lovely children, "We'll decorate the cake, you'll love it!" And so they did, and I did! 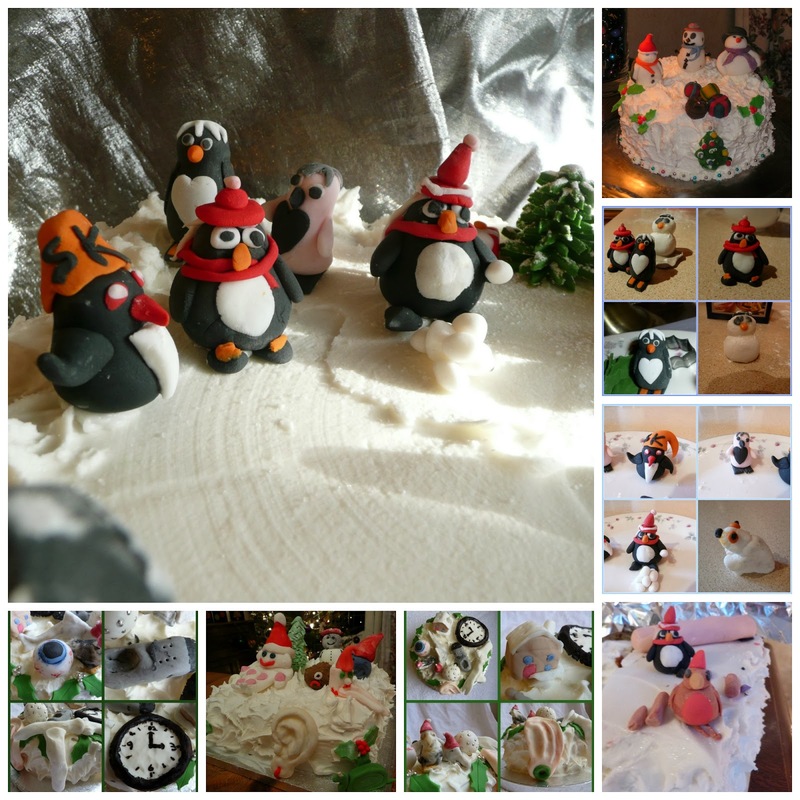 So here are some of my favourite creations, they are.............not ummmm............traditional! It's not the first time they've been on these pages but they make me laugh so much I just needed to share them again. But I think you'll agree they have their own charm LOL! So now we don't worry about RUNNING OUT OF TIME or FLU or anything, the in house artists have got it covered. Who knows what we'll get this year. Hope you have enjoyed my little snapshot of Christmas here in Baffins. I'm off to feed my cake. They certainly do, I do have to pay them though, with copious amouts of food and drink LOL! Finishing off those odds and ends!